When choosing a condominium on Jupiter Island special consideration should be given to Ocean Towers South. These 2,000-2,300 square foot units offer the unique features of being the closest to the famous Jupiter Inlet, they have direct ocean views, they have views of the Jupiter Lighthouse which has been functioning since it was completed in 1860 and they are the closest, oceanfront units to the bridge that connects Jupiter Island to the mainland. The 42 condos in Ocean Towers South were built in 3 bedroom floor plans with either 2 or 3 baths and there is a decorator lobby, exercise room, sauna, extra storage, covered parking and heated pool. Since they were built in 1972 most of these units have been upgraded to today’s standard with granite or other fine stone used on counters and flooring, stainless appliances and plantation shutters. But they all have the fabulous ocean views and expansive views up and down the coast. Jupiter Island is a name that conjures up fantastic images of sparkling clear, warm Atlantic waters teeming with fish like sailfish and wahoo, of wide deserted beaches, of swaying palms trees and warm ocean breezes. Jupiter Island is all this and more. Jupiter Island is so special the Nature Conservancy bought 73 acres just up the road and established the Blowing Rocks Preserve where development will always be prohibited. On the ocean side, big waves crash into the rocks shooting 30 ft. or more in air and on the Intracoastal side, hiking trails lead you through the native vegetation. In addition, near Blowing Rocks, Palm Beach County has Coral Cove Park with lifeguards and a playground. Living in Ocean Towers South you will just be a very short drive over the bridge to the Village of Tequesta with restaurants like Hog snappers and all the charm of a small, quiet village. 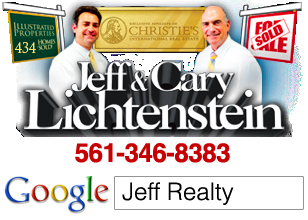 So keep these homes on your list when searching Jupiter Island. Posted in Jupiter Island condos, Uncategorized on October 9, 2011 at 1:59 am.